While Black Friday has long been a popular phenomenon for brick and mortar stores, the deal frenzy has been extending to e-retailers and online stores. Now, sales on the web are equally as lucrative as those in the stores. eBay is launching a campaign to capitalize on the holiday shopping season, called “12 Days Of Deals,” and has also rolled out a new Deal-focused iPhone app and partnered with Microsoft to offer deals directly from Internet Explorer 8. Today, the e-commerce giant is launching a interactive map that shows all of the transactions that took place on eBay on Black Friday. 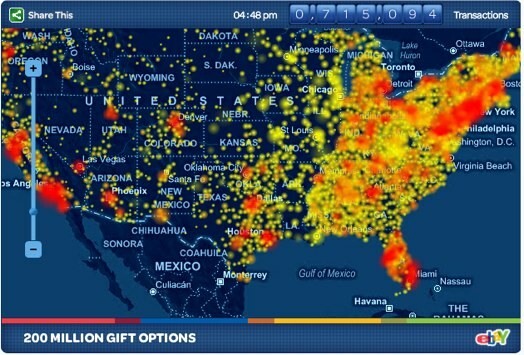 The map provides a visualization of all U.S.-based buyer and seller transactions that occurred on eBay on Black Friday. As the clock runs, points will appear on the map, representing the occurrence of buyer and seller transactions on eBay. eBay says the map visualization is based on raw data that includes eBay sales and purchases occurring in approximately 33,000 U.S. ZIP codes.